justthefood.com...the blog: Cooking Class & Demo on Monday: Vegan Easter Feast! Cooking Class & Demo on Monday: Vegan Easter Feast! This coming Monday, I will be doing a cooking class and demo at the Whole Foods Market in Torrance, California. 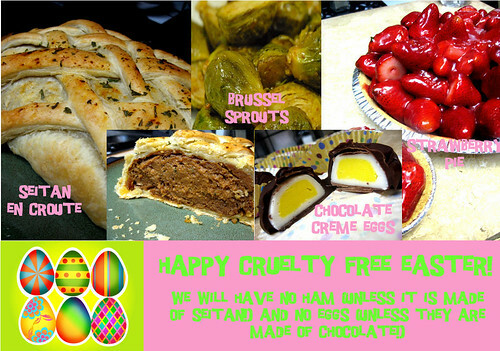 We will be making a Vegan Easter Feast, featuring the wildly popular Seitan En Croute! ...and just for fun, a vegan version of Cadbury's famous Creme Eggs! For more info & to RSVP CLICK HERE! I'm definitely trying those mustard-y brussels sprouts tonight! YUM! I have play the wow for a long times and have some good advice for you to get the best World Of Warcraft Gold with goods ways, I also have the best ways for you of the Cheapest WOW Gold, please don't hesitate !